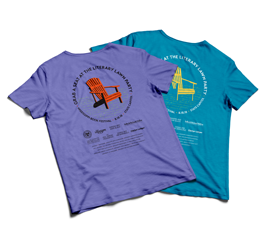 This year’s Festival T-shirt invites you to “Grab A Seat” at Mississippi’s hottest book festival. The t-shirt will be available for sale at the 2018 Festival, and afterwards at Lemuria Bookstore located at 4465 North Highway 55 #202, Jackson, MS 39206. Call (601) 366-7619 for availability. 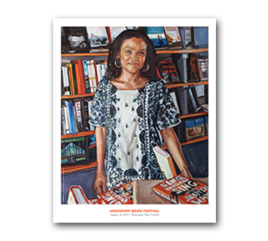 Baxter Knowlton’s oil on canvas “Jesmyn Ward” is meticulously reproduced in a signed 2018 limited print edition for collectors. Both the artist and his National Book Award winning subject represent the best of Mississippi and we are grateful for their support of the festival. The signed print will be available for sale at the 2018 Festival, and at Lemuria Bookstore located inside Banner Hall (4465 I-55 North, Jackson, MS 39206). Call (601) 366-7619 for availability. Both artist and subject represent the best of our state. 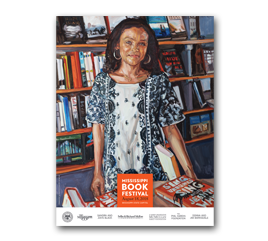 We are grateful to fine artist Baxter Knowlton and MacArthur Genius and National Book Award winner Jesmyn Ward for their support of the festival in the form of commemorative art. Knowlton’s oil on canvas painting of Ward, now on sale in a limited edition, reveals the intense love of his craft and captures the spirit of one of Mississippi’s most talented authors. The poster will be available for sale at the 2018 Festival, and at Lemuria Bookstore located inside Banner Hall (4465 I-55 North, Jackson, MS 39206). Call (601) 366-7619 for availability.